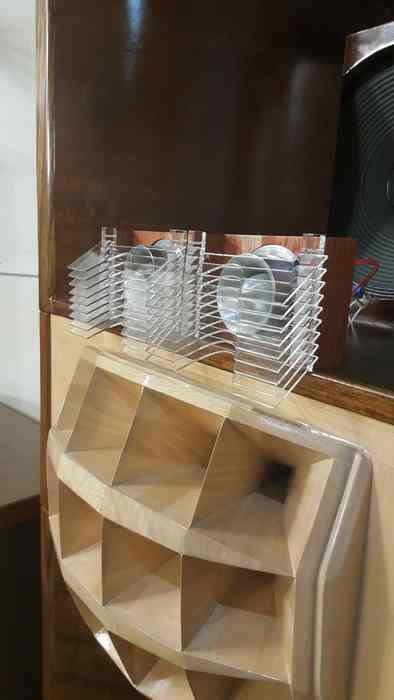 A worthwhile addition to any tweeter that "beams"
Having built up my Altec A7 Clones, I wanted to optimize the JBL075 tweeter, as the horn I had used tended to beam. 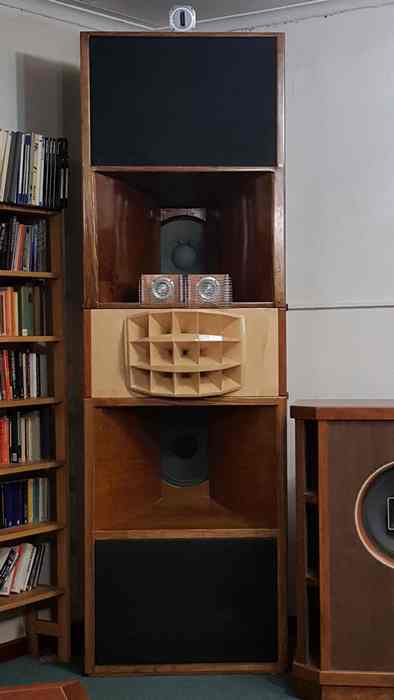 The HF multicells spread the "sweet spot" to the point where the speakers image over a very wide range of sitting positions and the tweeter narrowed the higher reaches. Plus a friend donated three more JBL075s, so two tweeters per side were tried. This proved to be an improvement, except that there was a degree of interference between the tweeters, which degraded overall imaging a bit, plus narrowed the "sweet spot". Around this point I connected up a JBL horn with lens, as per the picture below, to a friends Virtual Theater Organ and noticed that the sound output from the side dropped off to nothing; in fact from 45 degrees there was a sharp cut off. A bit of surfing on the net led to the build detailed below. Two links: Acoustic Lens and Design pretty much describe how this came together. The design pdf is to scale if printed on A4 paper. I looked into 3D printing the parts, but short of purchasing a 3D printer the cost would have been too high, perhaps in Europe or the US this might be an option. 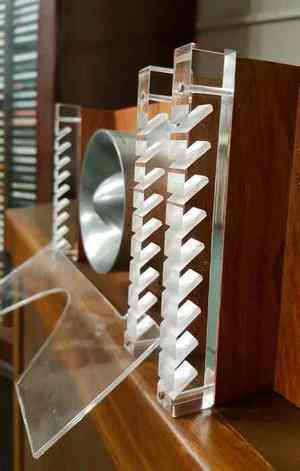 I settled on Perspex but metal would have done the job equally well. 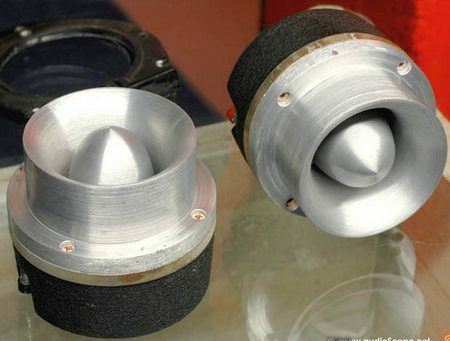 The tweeters used are JBL075 units (picture on the left) which were stripped down (picture on the right) and the Aluminum parts cleaned in a chemical bath, then scrubbed with soap and water. These come in 8 Ohm and 16 Ohm versions and as luck would have it I have three 16 Ohm and two 8 Ohm versions so each side has one 16 Ohm and one 8 Ohm fed directly from the amp, in parallel via a 0.1uF cap. 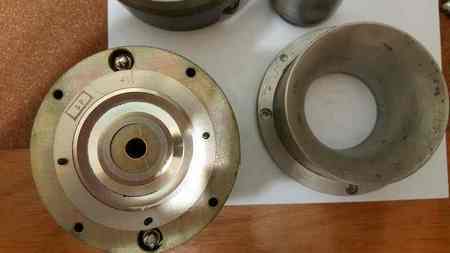 As standard the audio field output is 90 degrees, conical. 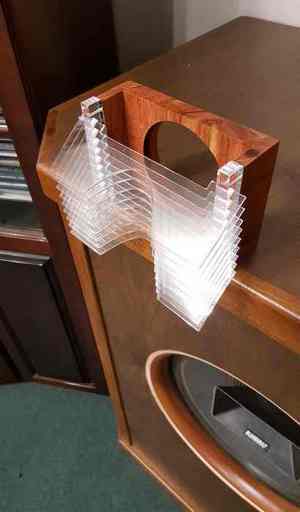 The frames to hold the tweeters are from Rosewood, with sufficient thickness to mount the Perspex uprights and a hole to suit the JBL075, which is quite heavy at 2.7 kg. The "bullet" protrudes slightly, hence the cut out in the lens plates. When mounting the bullet just clears the plate. The vertical slotted struts are pinned to the wood, everything pre-drilled to suit to stop the Perspex and wood cracking. Some care is needed when driving the pins home. Fitting the plates into the slots was a bit fraught as the plates and slots are exactly 2 mm and I was not keen on using glue to hold the plates in place. I ended up tapping the plates into place with the back end of a plastic handled screwdriver. Left to right alignment was adjusted, also by tapping, as each plate was fitted. On the right are the assembled four lenses. 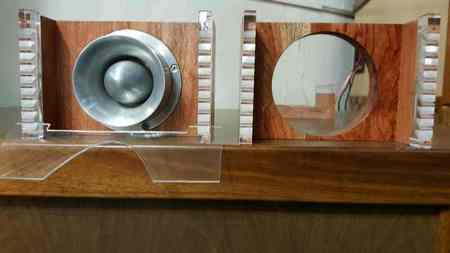 The JBL075 tweeter is one of the nicest vintage units around and was used in amongst others, the JBL Hartsfield and the JBL Paragon speaker systems. The reasoning behind using two per side (apart from I had them) is that the original Voice Of The Theater speakers were designed to play through a projection screen, hence the very lively HF and no tweeter for much the same reason. 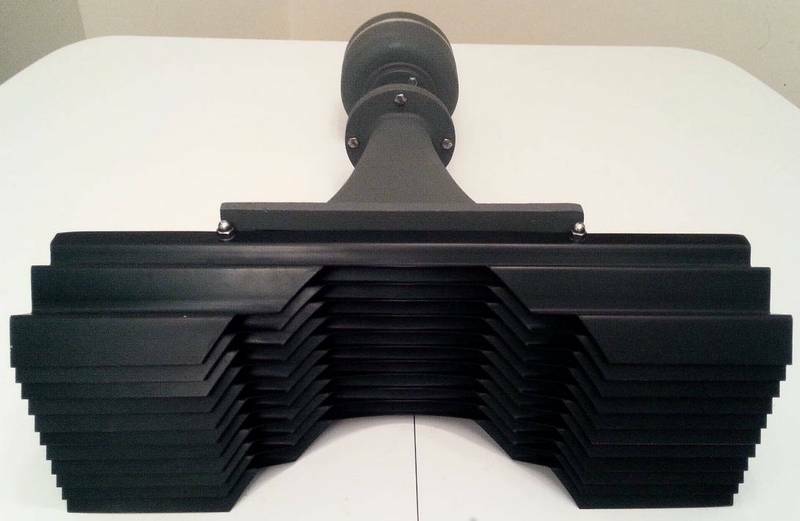 In building my A7 stack, I reduced the multicell horn size to drop the HF gain and needed a tweeter for the treble. Adding a second one has brought the system more into balance with no stress on any speaker component. 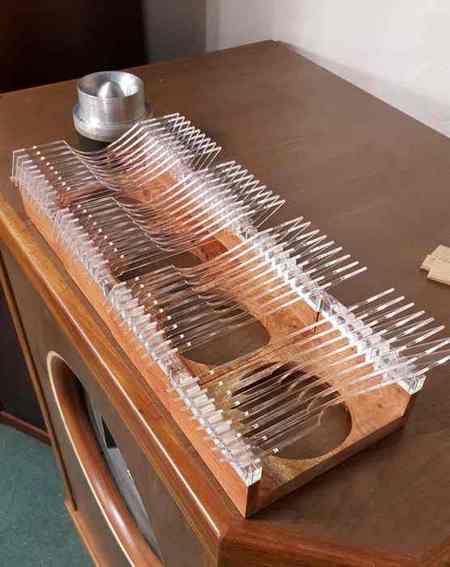 When two JBL075's were mounted side by side there seemed to be some interference, almost a comb filtering effect which I put down to the conical waves combining. The effect was subtle from the point of imaging although the very wide sweet spot was reduced to the normal narrow, need to sit in one spot audiophile thing. The clarity was good but not as I wanted it. For those with eagle eyes the unit at the very top of the cabinet is a Beyma CP21F Slot Tweeter brought in above 14 kHz as a supertweeter. 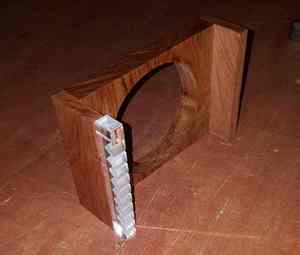 First of all, I am convinced that an acoustic lens is a worthwhile addition to any tweeter that "beams". The conical wave front is converted to a flat and wide field with the almost wasted top and bottom part added to what reaches the ear directly. In the linked pdf file "Acoustic Lens" above, Figure 5 shows what happens in the horizontal plane. It is maintained in that article that there is about a 1% loss which is more than made up from the concentration in the listening position. Having two lens equipped tweeters side by side as shown above works very well, the interferences noted are gone, the sound is cleaner and more defined, the sweet spot is back to over a meter wide (although the system still images well two meters on either side of the main seat) and the imaging is good enough to detect two trumpets as individuals next to one another in an orchestra for example. A big plus is that dynamically the entire speaker system can effortlessly reproduce sound at any sane volume. Stacking the lenses vertically or horizontally makes no difference that I can hear. The only problem I see is that over time they will become dust collectors!